The Lower Ballfield Tributary to Midland Creek project was identified by Intuition & Logic in the Midland Creek Conservation Stormwater Management Reconnaissance performed in 1999. The lower portion of the Ballfield Tributary was actively incising, while the upstream portions of the tributary were not yet affected by the incision. 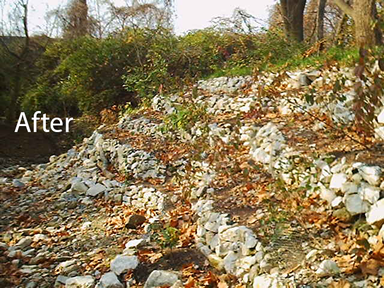 The City of Maryland Heights retained Intuition & Logic to design channel stabilization measures to halt incision and address the steep banks before the instability could propagate upstream. Intuition & Logic designed three Newbury style rock grade control structures and 180 feet of composite revetment bank stabilization. 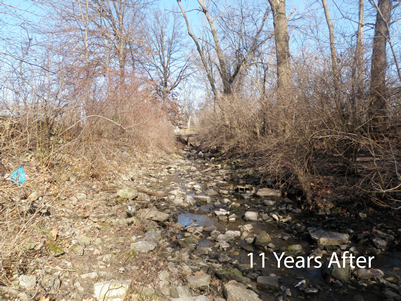 The improvements stabilized the lower 200 feet of the Ballfield Tributary, effectively halting the active incision in the tributary and restoring the riparian corridor in the area.